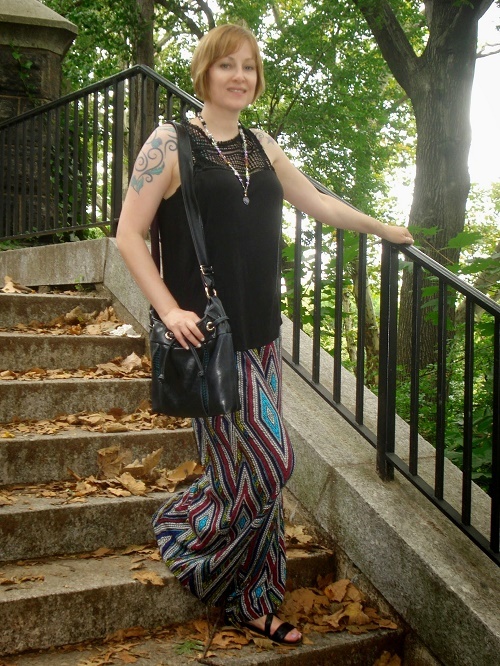 I bought a pair of colorful tribal-print palazzo pants this summer and found a few ways to wear them. 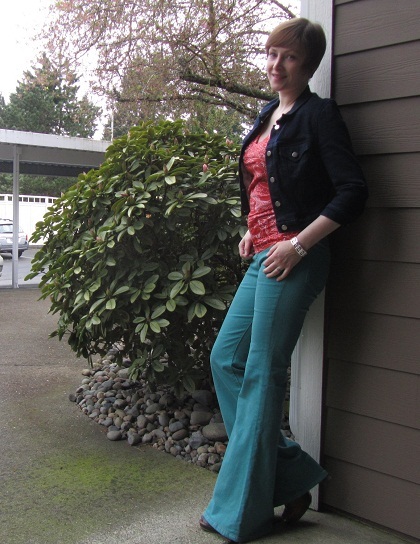 These look fun with a tank top in any of the colors in the pants: wine, teal, black or white. Sometimes a simple white T does the job well. This shirt has a slight cowl neck so it’s not exactly plain. On another day recently, I wore a loose, sleeveless shirt with a bit of detailing on the neckline. Finally, for evening, I wore a fitted black top with loose sleeves. I like getting lots of use of my clothes so I need to make sure I can wear items more than one way. These pants passed the test. Plus, they were cool and comfortable on my trip to NYC. I neat the heat in style, so I consider this a win. I wore these in parks, subways, on the street, and out to eat. What’s your go-to traveling outfit? 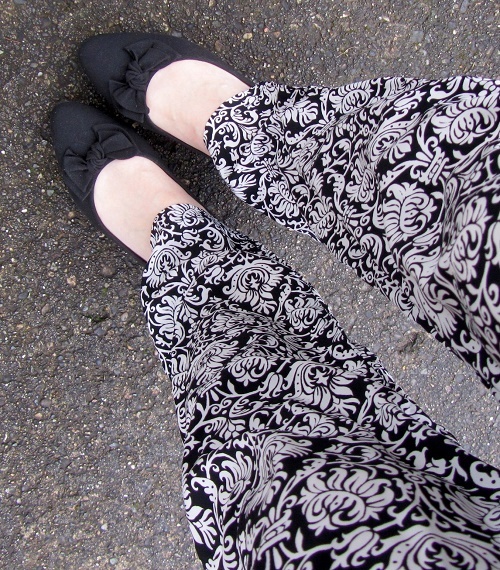 I love the comfort factor of pajama pants, but wouldn’t be caught dead in them outside the house. That’s why I love the loungewear as outerwear trend that popped up last summer. 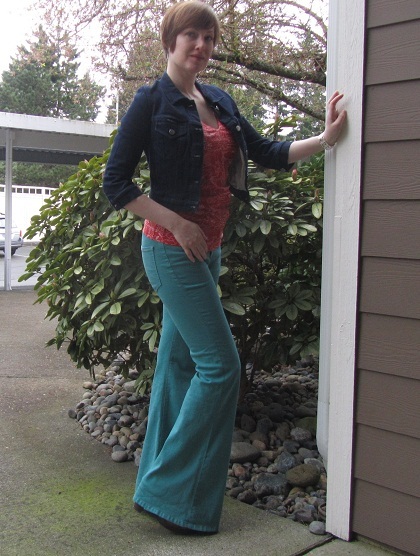 These are a soft, relaxed-fit pant, reminiscent of harem pants or lounge pants. With slippers and a smoking jacket, I’d rival Hugh Heffner for stylish boudoir clothes. But with ballet flats and an unstructured jacket, these are surprisingly appropriate for every day. I wore them to work and out to dinner. 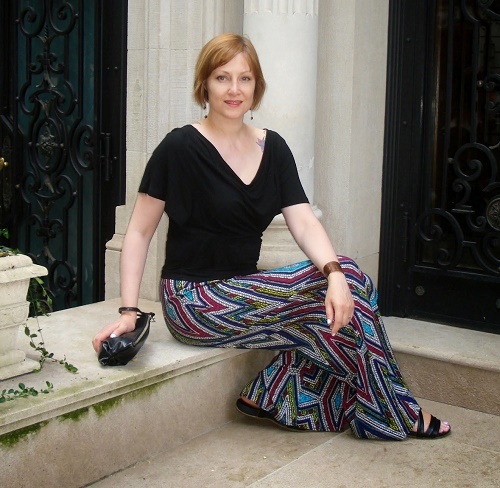 To be clear, these are “outside pants.” I bought them at Bébénoir when I have in New York last summer. I was lucky to have this incredible gem of a boutique just around the corner of my Harlem condo, where I lived (and pretended to be a local) for 10 days. I’d read about Bébénoir in a fashion magazine the week before I flew to NYC. I wanted to visit, but Harlem is a big place. I had no idea if it would be anywhere near my apartment. Imagine my luck when my taxi passed the shop, turned the corner, and dropped me off at my temporary digs. I must have shopped there every other day. I took my parents along too, and my mom loved their clothes (in fact, she bought a pair too, which you can see in her Harlem blog post). Bébénoir has a wonderful–and affordable–selection of men’s and women’s clothing and accessories (and super friendly staff). 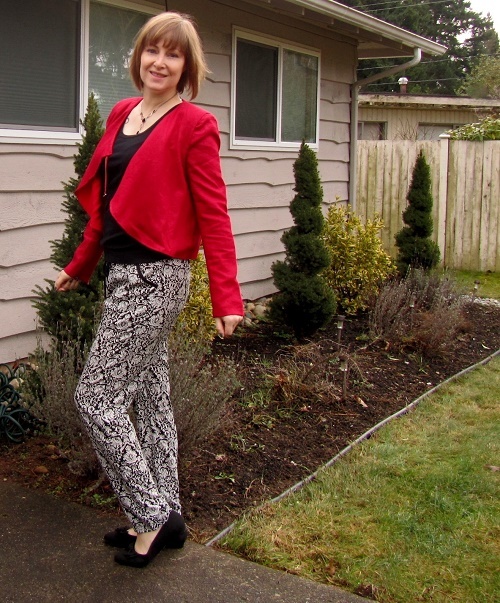 My Beyond Skin flats work really well with these pants. I got these as part of a Kickstarter. I donated toward their new line of shoes and received these. 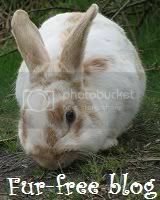 All vegan, ethically sourced, sweatshop-free, fair labor–and cute! If you haven’t checked out their site, do it now! I love their new spring line. I went crazy with pattern-mixing in this outfit. It was an experiment and I think I like it. 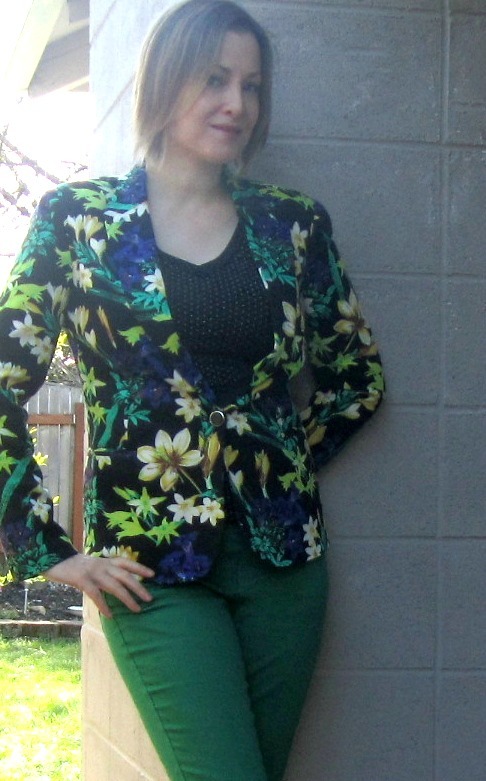 I don’t have a lot of floral pieces in my wardrobe and I really liked the floral jackets I’d seen in magazines. 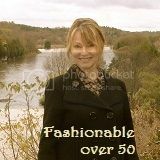 I didn’t want to invest in a jacket with a trendy pattern so I looked at lower-end stores. Forever 21 isn’t my favorite place to shop but I can count on them for inexpensive versions of trends. It’s a fun look and I can take it down a notch by swapping the leopard shoes for a solid pair. I can swap out the top for a plain T if I want to calm things down even more. But for now, I’m going all out with the colors and patterns. It’s only fashion, right? I’ve linked up with What I Wore Wednesday at The Pleated Poppy and at Transatlantic Blonde. 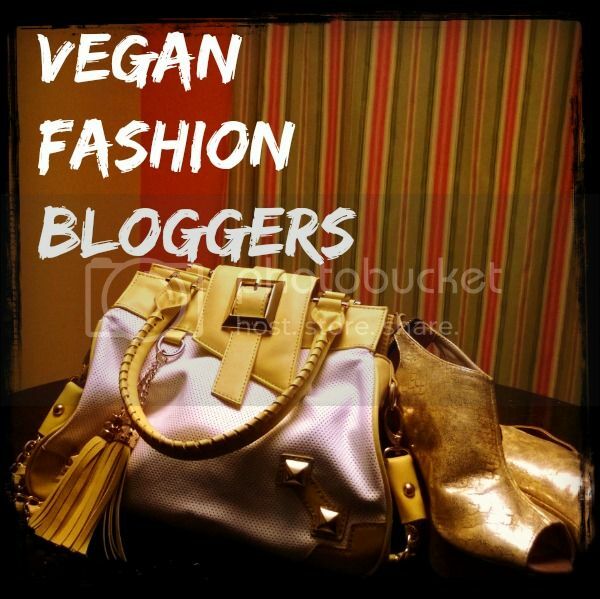 Check out what other bloggers are wearing! 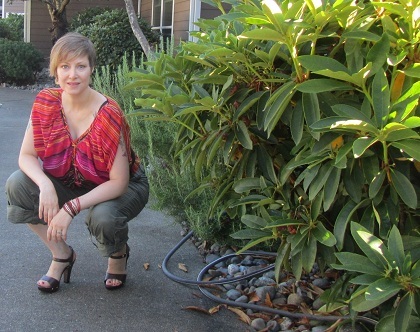 Wide-legged, lightweight pants are a perfect match for hot days. They’re as comfortable as pajamas and more socially acceptable in the office. 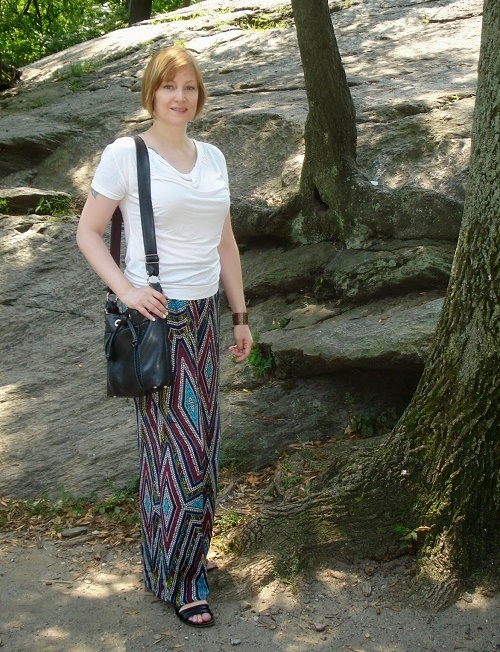 I got these floral palazzo pants on my recent trip to Georgia. 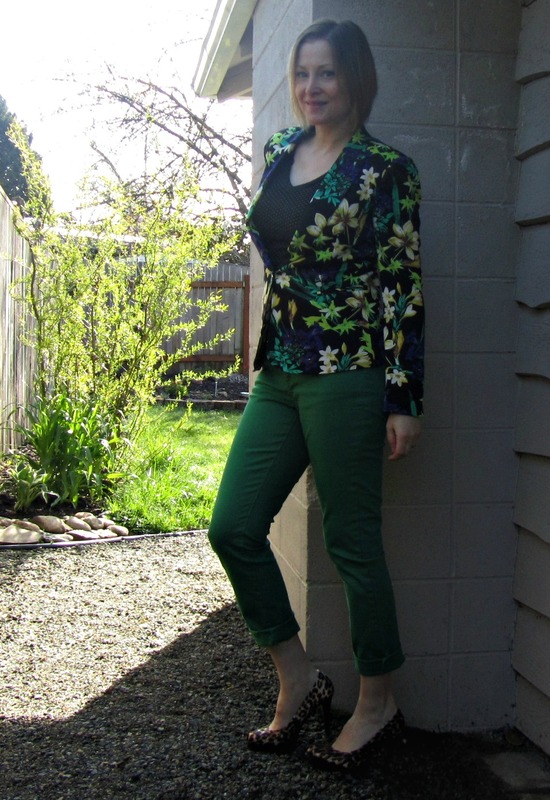 I’d been looking for a pair of floral pants and these were perfect! In Savannah, men and women wear colorful clothes so I was inspired to be bright too. I like that I can pair these with orange, yellow, brown, green and even mint. They’re a perfect candidate for pattern mixing too. A striped or dotted T would be fun! It’s practically impossible to see my sandals, but they’re a Savannah purchase too. I’ll make sure to show them off with shorts or a skirt soon. I was looking for a pair of brown or caramel faux leather flat sandals and lucky for me, I found them on my trip. 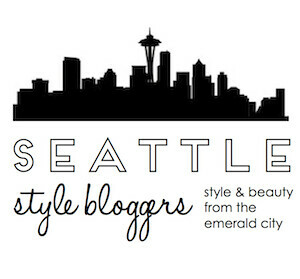 I’m linking up to The Pleated Poppy, Transatlantic Blonde and Fashion Informant for some group blogging action. Check out what everyone else is wearing. Okay, it really wasn’t poncho weather but I had on my teal flares and the poncho added to the 70s vibe so I went with it. I probably should have worn a coat. I had a photographer (my husband) help me on this day, and I like that you can see him in the reflection in the window. The ladder is in the empty store behind me. It makes for quite a mashup! 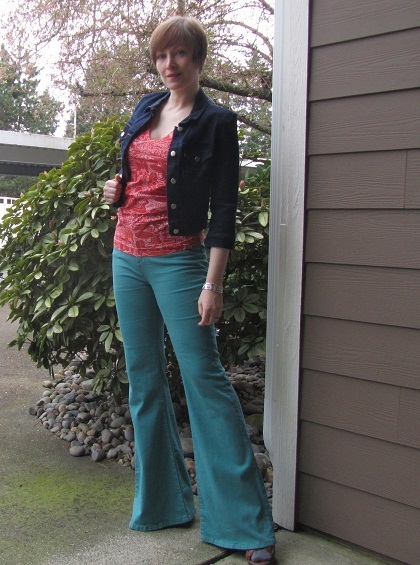 I love flares and skinny jeans equally. They both give me a pep in my step, just in different ways. 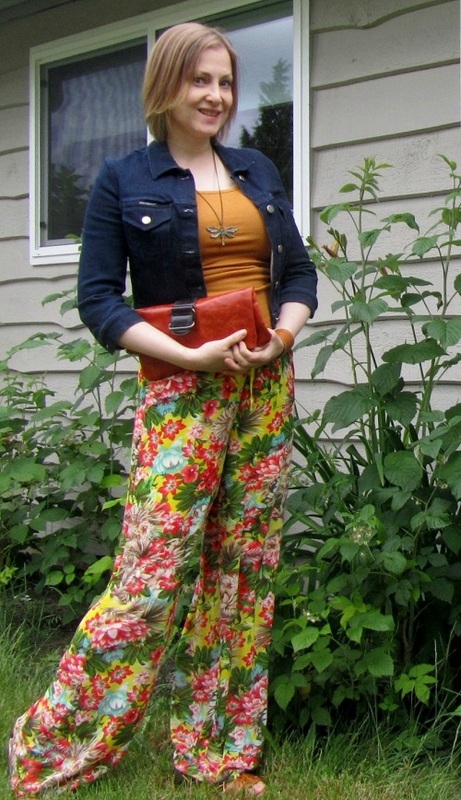 I’ll probably never narrow down “a look,” but boho rock n’ roll might come close. Others just call me quirky! How would you describe your style? What types of styles are your favorite? 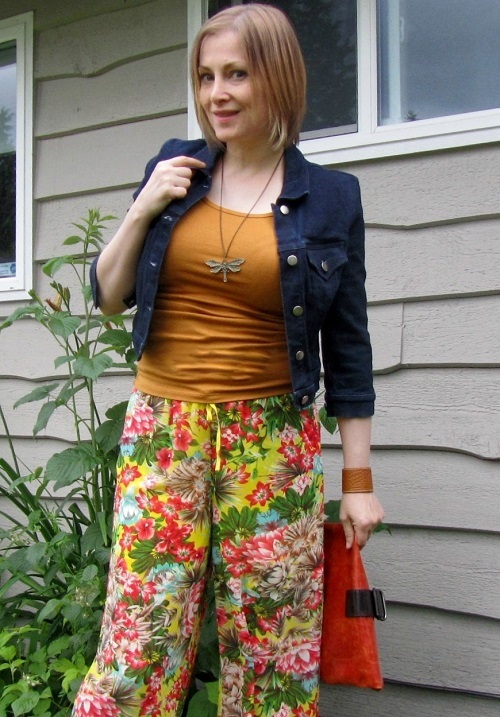 I’m linking up with Visible Monday at Not Dead Yet and Thrifters Anonymous at Color Blind. Check out what the others are wearing to get noticed! I look forward to Christmas and New Year’s parties and love to dress to the nines. For me, that usually means a long dress. For black tie events, I like to wear a gown, but I’ve been known to wear cocktail dresses to less formal affairs. Sequins, satin, velvet and embellishments add to the holiday flair. This year I had two parties on my list, and I broke tradition: I wore pants. I wear pants a lot but I’ve always thought dresses were, well, dressier. 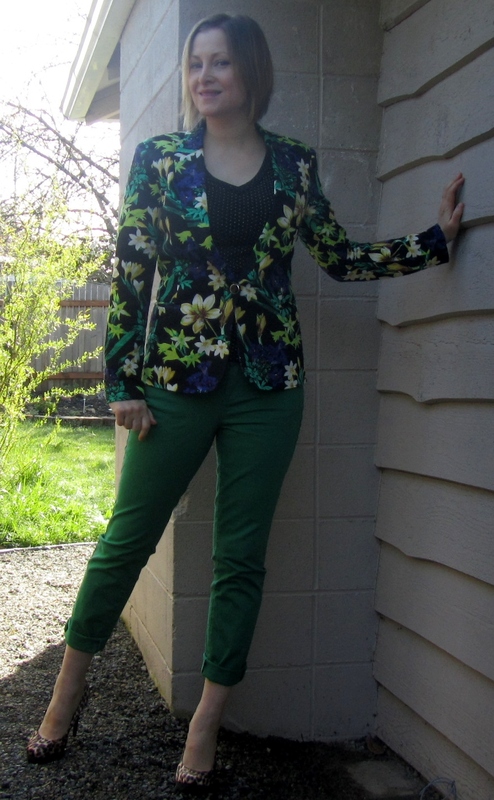 However, I had a fantastic sequined blazer and I wanted to try it out. For the first holiday party, I wore the blazer with a cowl necked ivory top and glazed black denim. Yup, I wore jeans to the biggest party of the year. But I paired them with Christian Louboutin booties, which take any outfit up a few notches. And when denim is black, it always looks elegant. The next party was just as fun, and I was one of the MCs! I had to corral 200 of my closest colleagues and lead the events of the afternoon. I’d heard it was a tough job (“herding cats” was part of the pep talk), so I dazzled them with red satin pants and the same sequined blazer I’d worn to the gala the weekend before. I was determined to get noticed. It worked. I chatted up the room, kept the events going (gingerbread house building and a white elephant gift exchange were on the list), and made sure people found the main buffet, vegan table, and chocolate fountain. Dressing the part helped get me into the role and made people pay attention to what I had to say. Carrying a mic around and talking to a crowd that big isn’t part of my usual day! 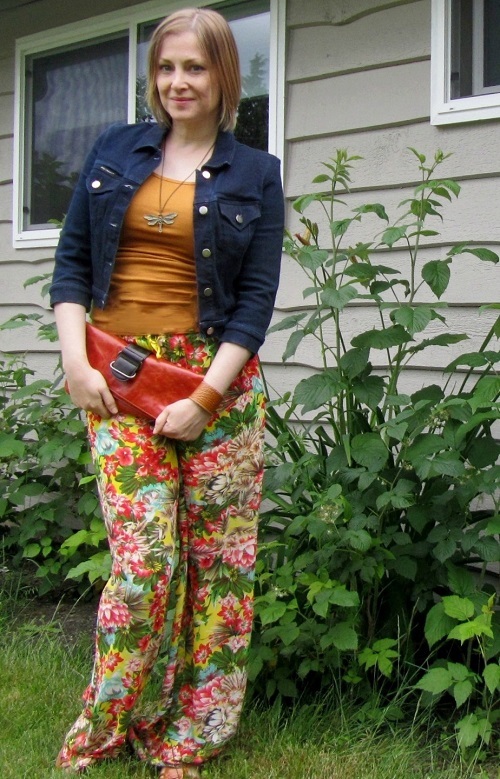 I loved these pants when I found them at Goodwill and knew I’d find a good use for them. The only problem was, with heels, they were a bit short. I like to break fashion rules, but unless they’re gauchos, wide pants need to be long–at least in my book. The solution: Hubby let out the hem for me so the pants could skim the ground as they were intended. Yes, the creases still visible (and I need to finish the edge), but no one noticed. What’s worse than a frayed edge? Highwaters. Definite faux-pas! Have you been to any holiday parties lately? Got plans for New Year’s? If so, let me know what you like wearing to festivities. 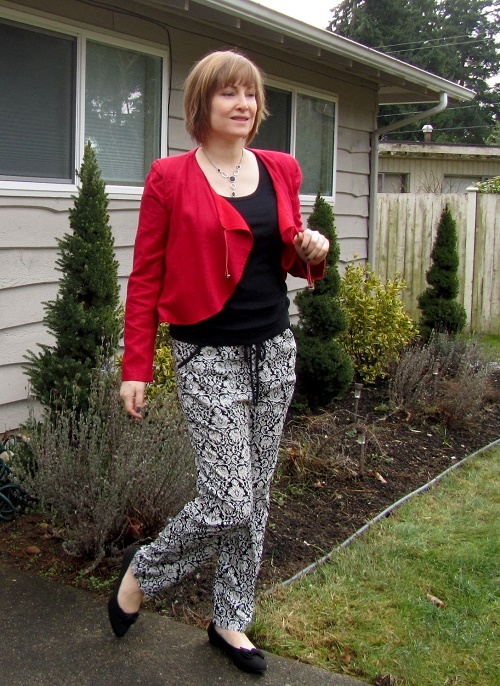 This post is part of the Ethical Fashion Bloggers holiday party challenge, Visible Monday, and Thrifter’s Anonymous–a three-fer! 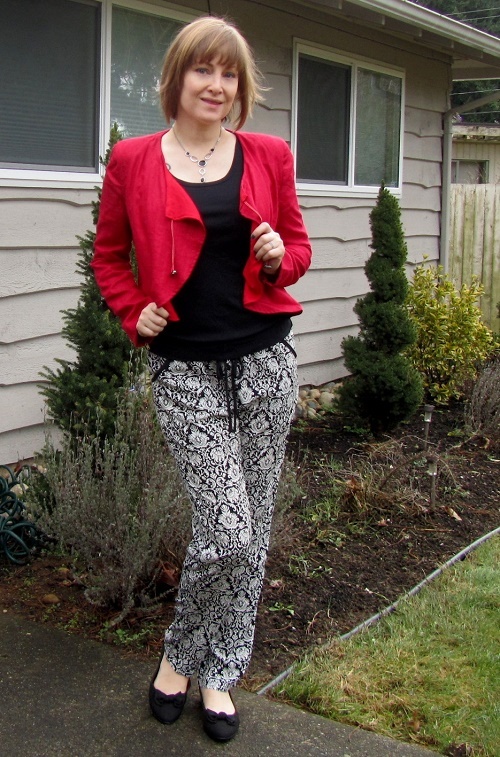 I can’t believe I’m wearing Dolce & Gabbana giraffe-print pants! Never expected to own a pair until I found these at Second Time Around Consignment in Boston. Yes, I’m still showing off my haul from the Boston trip Donna and I took in June. I hit the consignment store jackpot. These retail for about $600 (if you compare them to similar styles on the D&G website), but I got them for $40. The best part, and probably the reason I’ll never part with them, is that on the inside of the waistband is a label that reads “Kimberly Gordon.” It’s completely separate from the D&G label. Could these have once belonged to Sonic Youth bassist Kim Gordon? If anyone can confirm this, let me know. They’re a probably a size 2. Is Kim? Oh, that brings me to the only problem with the pants. I’m not a size 2. So I did what any brand-loving cheapskate would do. I bought one of those belly bands that pregnant women wear to get more use out of their pants before they have to switch to maternity wear. I have no shame. I keep the pants unzipped, layer on the smoothing belly band, and then throw on a shirt. It works! Try it after Thanksgiving dinner. So now you know my secret. Would you go this far for a cool item? I’m participating in Thrifters Anonymous and Visible Monday. Check out those sites to see what others are wearing. I have to admit: I’m not a fan of the look of high-waisted pants. 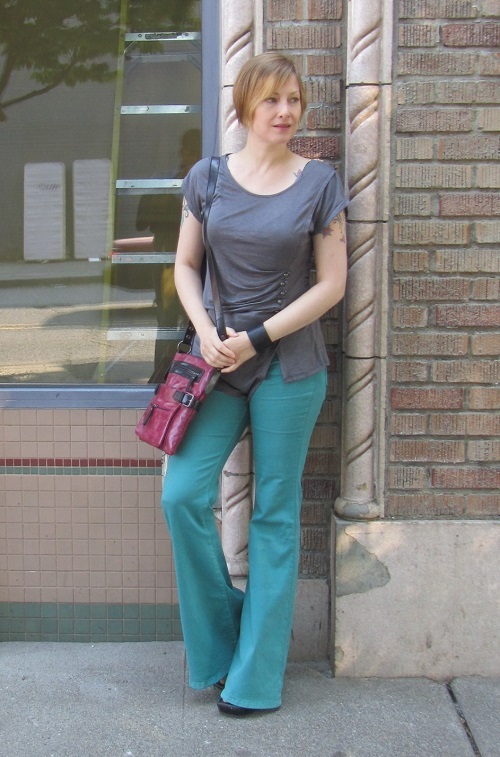 But I loved the color of these pants and the super-wide legs so when I saw them at Crossroads Trading Company I tried them on. I usually leave my shirts untucked so you can’t really tell they’re high-waisted. The high waist is really comfortable. They stay up nicely, and I don’t flash my underwear when I sit down. There’s something to be said about that. I’m still not flaunting the waistline though! I love how long these are too. Very ’70s and very leg-lengthening. I like when long, wide pants hide my shoes–except for the fact that no one gets to see my footwear. Have you tried high-waisted pants? What about flares? While wandering through Belltown, a Seattle neighborhood, a few weeks ago, I took a picture of a graffiti wall. It’s next to Vain hair salon and is part of a public parking lot. I enjoy artistic graffiti, but don’t appreciate tagging or vandalism. There’s a fine line between the two and a lot of it boils down to personal opinion. This wall reminded me of living in Toronto. I loved when the subway emerged from underground and ran, surface-level, behind the buildings on Bloor Street. 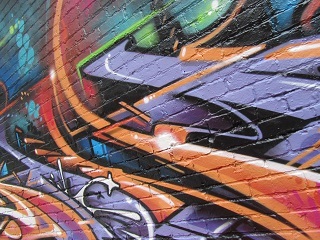 The back of the buildings had an ever-changing array of graffiti. I liked the combination of the black wall and brights, so I promised myself to use this inspiration. 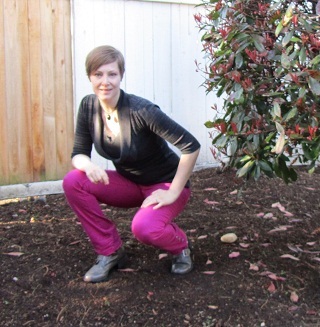 I pulled out my fuchsia pants and paired them with a graphite-colored top. Sometimes it’s nice to have a casual day. 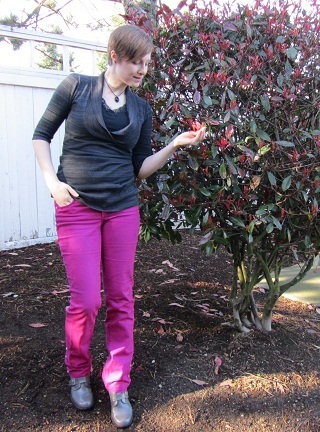 Bright pink pants are not for the shy. I wore these for the color-blocking challenge recently. How would you style pink pants (or would you)? What do you think about graffiti? Does it have a place? It is art? I dolled up my olive drab cargo pants today so I wouldn’t look like I walked straight off a military base (not that there’s anything wrong with that). I found these sans tag in the Macy’s junior department. They fit well and came with a belt. What more could I ask for (other than a great price)? I was worried the sales clerk wouldn’t be able to sell them to me without a tag, but she recognized the pants, told me they were on sale, and rung them up for $11. Sold! During that same shopping trip, I bought this bright, gauzy top. 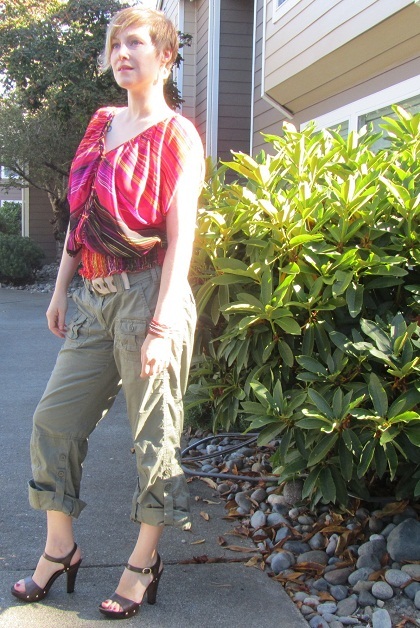 I’ve worn the top with white pants but like how it contrasts the toughness of the cargos. The deal of the century, though, was these shoes from Payless. They were originally $24 but were marked down to $7. And they the clerk gave me a $4 off coupon. All I needed to do then was pile on a bunch of stretchy, beaded bracelets in colors that match the top. Lately, I’ve felt rather naked without arm candy.